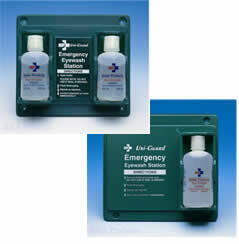 Be prepared for emergencies. An ever-present danger is the risk of dust particles or small foreign objects finding their way into someone's eyes. Providing for immediate care must be a top priority. The fastest and safest treatment is to flush the eyes with a sterile buffered solution. 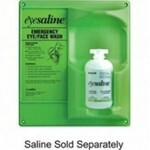 Our Eyewash Stations contains 16 or 32 ounce bottles of the highest quality, sterile, buffered eye irrigate available. Because bottles should not be re-used after they have been opened, we provide modesty-priced refills for these wall-mounted stations. Station dimensions: (32-oz stations) 13-7/8" long by 12-7/8" high by 4" deep, (16-oz stations) 12-7/8" by 11-1/2" by 3-3/4" deep.